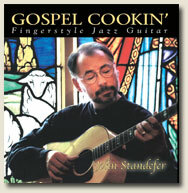 For years John's Gospel Cookin' book & CD set of jazz guitar arrangements has been one of his best sellers. By popular demand, the recording has now been devloped into a free-standing CD! Better yet, John has added 3 new song arrangements and remastered the whole project to provide and even richer collection of your gospel favorites.